Come hither ye dust and gather upon my trinkets. Nothing says Collector Edition more than a 12 inch figurine that attracts the dead skin cells that waft around all our homes. The Developer FromSoftware are not looking to disappoint and have revealed a their own Dark Souls 2 Collector Edition, available in limited numbers on March 11th. The original Dark Souls is a cult Co-Optimus favorite, so we have high hopes for the 3 player online co-op sequel. The game is due out on March 11th for both the PS3 and 360, but PC gamers will have to wait a little longer as no official date has been announced for this platform. 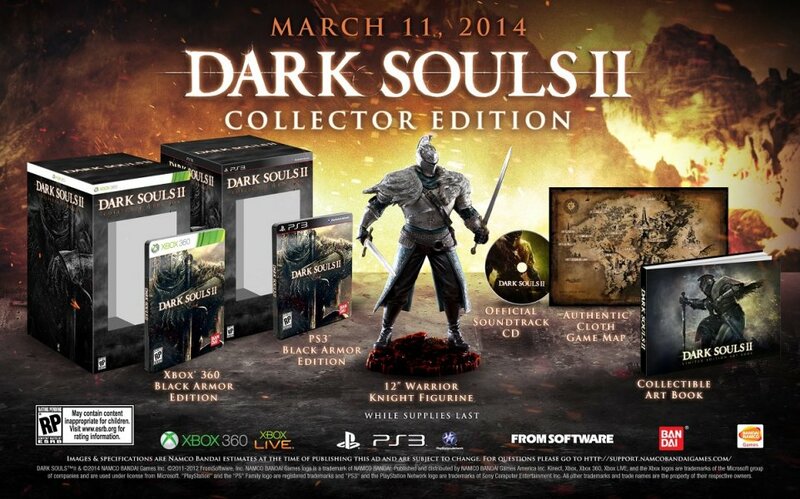 The DARK SOULS II Collector’s Edition will feature a premium quality Warrior Knight figurine measuring in at 12 inches in height and weighing in at nearly 16 ounces. Fans will also be able to thumb through an exclusive hardbound art-book filled with never-before-seen images created by the talented artists at game developer FromSoftware. True adventure fans are sure to enjoy the sizable full-color fabric map of the DARK SOULS II game world that can only be had within the Collector’s Edition. 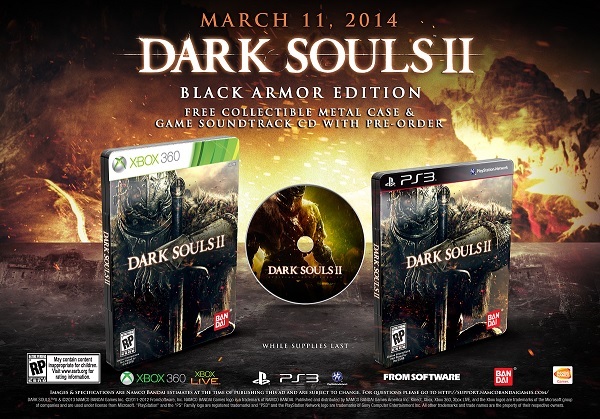 Topping off this extensive package is the metal game case from the DARK SOULS II Black Armor Edition which will contain both the game disc and the official game soundtrack. As the blurb suggests, owners of the Collector Edition get a figurine et. al., but also get the Black Armour Edition as standard. Essentially, this is a steelbook version of the game that will be available to anyone who preorders whilst stocks last. Being metallic will be a great bonus as it should survive being thrown against the wall a few times as you die yet again. Page created in 0.2917 seconds.